More extreme sports from Big Ben Interactive. 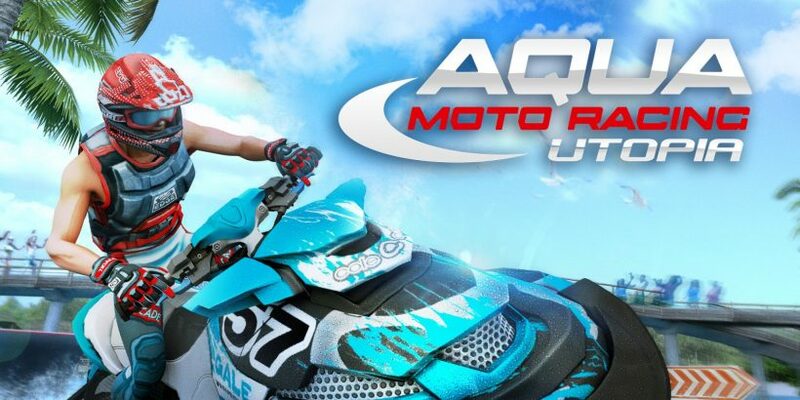 Aqua Moto Racing Utopia, which released alongside Snow Moto Racing Freedom initially as an Italian exclusive but which later made its way to the UK, shares many similarities with its close-to-namesake, albeit applied to a slightly different extreme sport. However, if I had to pick one of the two, this is the game I would prefer to play. The starting line – nope, they’ve not already fallen off. Starting immediately on the visuals, the snow game, which I reviewed back in March, naturally has a very limited colour palette of white and shades of grey to deal with. 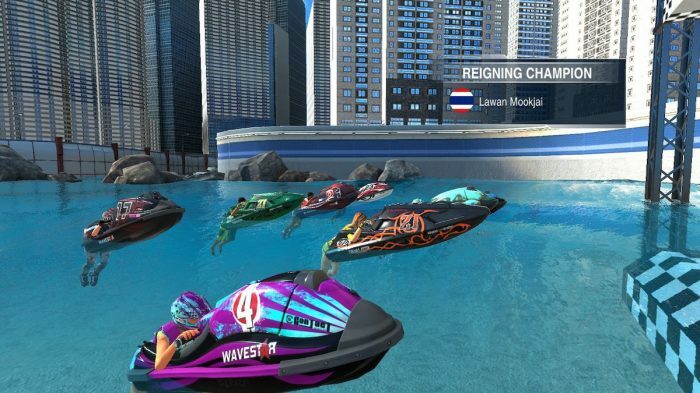 By comparison, Aqua Moto Racing Utopia is much more colourful and is helped by race courses set in a variety of different environments, from racing around an oil rig to even tearing through the water inside of a sports stadium. The game is just far more interesting to look at from the off, and that lends to a bit more atmosphere too – you feel like you’re around life, while there were moments in the snow game that made you feel isolated up in the mountains. The best part by far is the mayhem caused by shoddy tricks. Much like in the snow game, the racing action is based around reaching markers and performing sharp turns around them before heading off to the next one. All the while, you’ll get a rating for how close you manage to get to each marker, building up a boost gauge which allows you to unleash some serious speed. The trouble is, with so many twists and turns on each course, most of the time it’s too difficult to maintain your control and keep your racing line when pulling the boost trigger, and you’ll only have a realistic chance at pulling it off at one or two straight points in the course. Miss three of the markers by passing them on the wrong side, and you’re disqualified. This is pretty harsh, too – you will get bumped off course by your opponents in cases and pushed unwillingly the wrong side of the marker, but the game hardly gives you a chance to correct yourself before it whips out a strike onto your record. The podium. Considering you just put your life at risk taking on a bunch of maniacs, that second-place prize is a bit rubbish. Tides add an extra element to the gameplay too. You can perform tricks as you go over ramps littered across all of the courses, with the penalty of falling off and losing valuable seconds if you don’t land facing in the right direction at the end of them. But in the oil rig course in particular, the water is so choppy that you feel like you’re in a posh leisure centre’s wave machine, and picking up speed to get the air to perform tricks is likely to launch you way beyond where you were hoping to land. So the challenge is there, and the arcade gameplay is nigh-on the same as in Snow Moto Racing. If it’s a racing sim you’re after, I’d go for this over the likes of MXGP3, which I reviewed earlier this week, simply due to the depth. 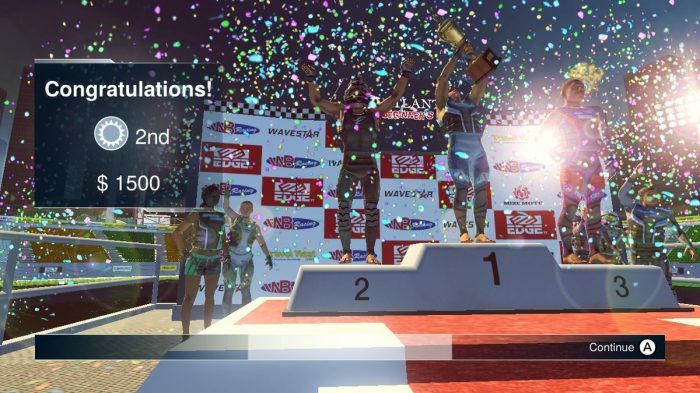 This has local, online and split screen multiplayer – top marks for that, when the aforementioned motocross title had zilch by way of letting you play against friends. Add in the race types, focused on speed, markers and tricks respectively, and you’ve got a fair bit of variation here. 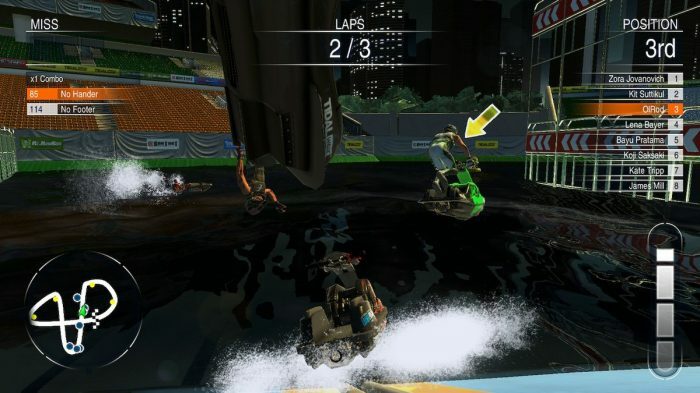 Aqua Moto Racing Utopia is a solid and fun, if unspectacular title. Hunt down the physical copy if you must, but it won’t break the bank on the eShop.